Eating Healthier takes a determined mindset for people like me. I am a foodie. I love to look at food, smell food and of course prepare and eat it too! Before starting my diet, I honestly sobbed over a cheeseburger. Hey, don't judge! One of the first steps I have taken in the long term of family eating habits is I am re-discovering what a serving size is. Nearly everyone I know serves and eats more than the recommended serving size regardless of what kind of food it is. When I started re-visiting portion sizes and good food choices, I decided to start in 2 places. To serve a smaller portion of food to myself everyday and to cover more than half of my plate in vegetables. I love cauliflower, but it seems I only buy it in bags of premixed veggies. This week I stepped out of my normal zone of purchase and bought a head of the white stuff. I trimmed it down and gave it a good soaking. After I let it dry for about 10 minutes I began to slice 1/2" to 1" steaks of cauliflower. From there I drizzled it with E.V.O.O and gave it a delicate sprinkle of coarse black pepper and a pinch of salt. I flipped each steak over and repeated this process. My oven was preheated to 350 degrees. After I kept an eye on my cauliflower and flipped it about 13 minutes into the roasting. When the cauliflower was a color I desired I took it out of the oven and slapped it on plates with a communal dish of hummus and pita chips. My husband and I both went wild for this recipe. It was filling, made simply with every day ingredients, and it gave the cauliflower such a wonderful flavor! This is new favorite addition to our meals. It can be the main course, or a divine side that just about anyone would enjoy. I am going to experiment with seasonings to add new dimensions of delicious to our "cauliflower steaks". How is your favorite way to enjoy cauliflower? You had me at hello! I love vegetables and need to find ways to incorporate them into my meals (and my teenage son's) without making 2 different meals for dinner. Travis (Mr. Anti-Vegetable) enjoyed the mashed cauliflower I made. I'm not sure if he would like this because it's not in disguise, but he would probably try it. I'm definitely making this soon. I just tried roasted broccoli for the first time. I love broccoli and never thought I could love it MORE, but I do. this could be a new one to have them! This looks yummy. I have never tried cauliflower, however, I am open to trying everything at least once. These sound yummy, I used to love eating Cauliflower mashed with cheese! Yummy! I LOVE cauli candy (what I call roasted cauliflower lol), but a whole steak of it?? Ooh bliss!!! This needs to happen SOON! Stopping by from Titus 2 Tuesday! We love cauliflower at my house, we usually serve it steamed or mashed. 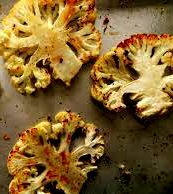 I love the idea to roast cauliflower steaks in the oven, it sounds like a wonderful preparation, I bet they'd be good on the grill too. This is one of my favorite posts from last week's What'd You Do This Weekend? and will be one of my features at tomorrow's party, I hope you will join us again!